We know how important it is for everyone—a child returning from school, a parent arriving home from work or a senior getting back from medical treatment—to return to a safe and comfortable home. That’s why SMO Energy and our parent company, The Wills Group, are committed to ensuring safe and healthy homes within our community. We provide assistance to qualified, low-income homeowners across Anne Arundel County, Prince George’s County, and Southern Maryland (including seniors, veterans, single parents and those with disabilities) by providing energy assistance, including free equipment repair and replacement. We also invest in local community organizations to provide critical home repairs that preserve homeownership. Our employees volunteer with local housing groups to improve or build homes, while SMO Energy provides discounts to these groups and other nonprofit organizations within SMO’s footprint. Our shared goal is to ensure that everyone has a safe and healthy home. Over the past year SMO Energy and The Wills Group, through our new SMO Cares Program, have provided over 20 members in the community with free equipment and fuel to heat their homes, and have provided assistance and volunteer hours to organizations providing safe and healthy homes to members of our community. We have contributed over $30,000 to the Maryland Energy Assistance Program, which helps individuals access funds for their energy bills to heat their home over the winter. Through our partnership with Lifestyles of Maryland, Inc., we have helped over 20 people receive new HVAC equipment either for free or at a reduced cost. We trained internal employees on how to keep their home safe and healthy because we believe that helping others in the community to have safe and healthy homes starts with our employees. We donated hundreds of volunteer hours to repair and restore water to Martha’s Place, a transitional home for women and children in Charles County. 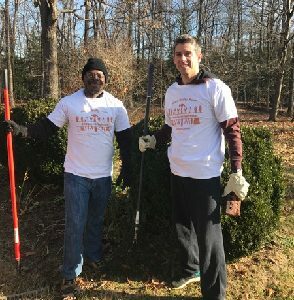 We donated hundreds of volunteer hours to complete a Rebuilding Together Home Blitz, where company employees divided between two homes in Charles County to help with: painting, landscaping, electrical issues, plumbing issues, building a new deck, power washing the home, and other home repairs needed to make these two homes safer and healthier for the homeowners. SMO Energy is proud to operate in Maryland and serve the community.